This product was formerly known as “Triple Crown Omega MAX®” . Omega-3 fatty acid supplement. Ideal for horses needing to improve immune function and hair/hoof condition and helps reduce inflammation in exercised and older horses. Made of 100% golden ground flax, this product provides 95 g/lb. Omega-3 Alpha-Linolenic Acid and 27 g/lb. of Omega-6 Linoleic Acid. Naturals Golden Ground Flax is not stabilized by common methods of a cooking/heating process but is stable due to the way seeds are sorted and cold-sliced which allows for a 2-year shelf life. *Our online store is NOW available! 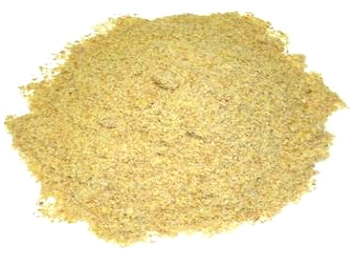 Click here to place an order for Golden Ground Flax. Feed at a rate of 6 oz. to 1 lb. per 1000 lbs. of body weight. Not intended as a vitamin and mineral supplement. Please feed along with a TC feed that has been recommended to you or please call 800-451-9916 for a recommendation. I spoke with a local rep at a recent symposium and she advised trying flax to combat inflammation and promote hoof growth in my 17 year old mare. I will be incorporating it into her diet and excited to see what it will do for my girl! I only give 2-4 oz of this to my horses and they look awesome. Colors are deeper, whites whiter, and they never look dirty. They're shiny and feel soft. This flax product and a vitamin E supplement together has helped my cow who has bad insect bite reactions. The flax keeps her skin from being dry and coat feeling softer and looking darker than usual for summer. The flax and vitamin E combo also helped my 25 year old mare finally shed out all her winter coat. Give it a try. My horses glow from using this product! I feed 1/4 lb once a day to my 2 senior mares( 23 & 28 y/o). I love that it is in the Naturals non-gmo line. It is ground AND stabilized! My horses glisten because of this supplement.